1. Dow 23,000: The Dow Jones industrial average briefly eclipsed the 23,000 point barrier on Tuesday. The index, which has added roughly 25% since President Trump was elected, closed at a new record of 22,997. The S&P 500 increased 0.1% and the Nasdaq ended the session flat. 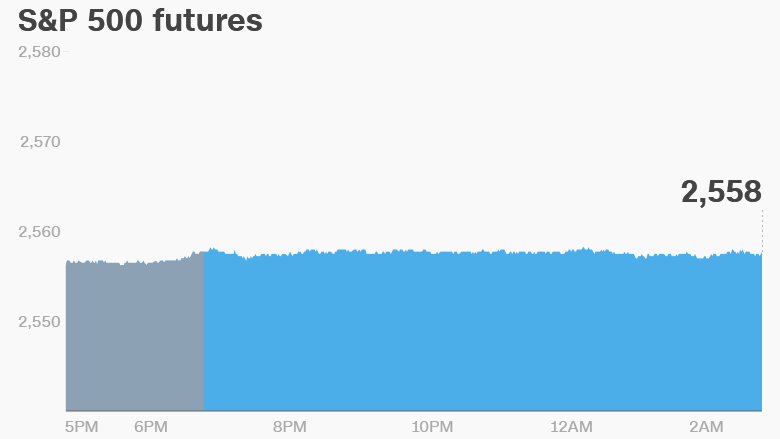 There could be more gains on Wednesday: U.S. stock futures were edging higher ahead of the opening bell. 2. China's economic vision: China's leaders are gathered in Beijing this week for the National Congress of the ruling Communist Party, an event that takes place just twice a decade. For President Xi Jinping, the summit is a chance to tighten his already strong grip on power. During his first five-year term, he made it clear that the Party's interests take precedence over market forces. On Wednesday, Xi stressed in a major speech that China must continue with "national rejuvenation" on its own terms and not "mechanically copy the political systems of other countries." While the economy has grown at an impressive rate, experts say that Xi's government has failed to move quickly enough to deal with soaring debt and bloated state-run companies. 3. Global market overview: European markets were mixed, while most stocks in Asia posted losses. Oil prices were 0.4% higher. 4. Companies and economics: U.S. Bancorp (USB) will release earnings before the U.S. open. American Express (AXP), eBay (EBAY), Kinder Morgan (KMI) and Sallie Mae (SLM) will follow after the closing bell. The U.S. Census Bureau will release its housing market report for September at 8:30 a.m. ET. The Energy Information Administration will follow with its weekly petroleum report at 10:30 a.m. The Securities and Exchange Commission has accused mining giant Rio Tinto (RIO) and two former executives of misleading investors over the value of a coal mine in Mozambique. Rio Tinto said in a statement that it "intends to vigorously defend itself against these allegations." 5. Stock market movers: IBM (IBM) shot up 5% in extended trading after reporting strong earnings on Tuesday. Friday -- Earnings from General Electric and Procter & Gamble.